He’s one of the UK’s most beloved homegrown artists. 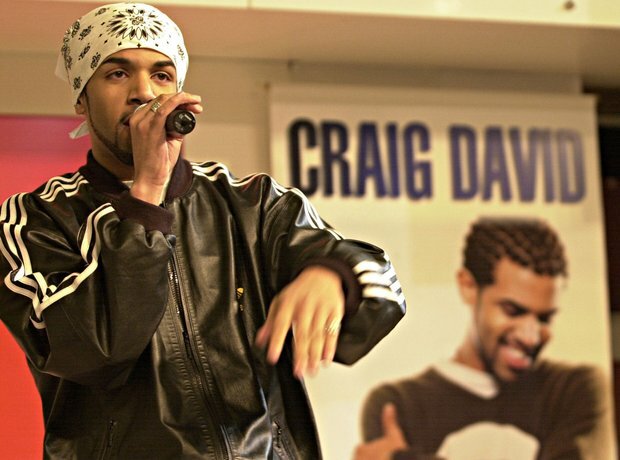 From his humble beginnings as an up-and-coming garage artist to headlining arenas and festivals all over the globe, this is the story of how Craig David went from underground MC to worldwide R&B superstar. 1. As a child, Craig was surrounded by music. His father George even played bass in a reggae band. At 11, his dad encouraged him to take guitar lessons. He would often accompany his father to local dance clubs where DJs would let him take the microphone himself. Within two years he was writing his own songs, and by 14 he was already MC-ing in clubs and on small radio stations. 2. Craig started making waves in the industry after winning a national song-writing contest. The young singer wrote a song called "I'm Ready" for the R&B boyband Damage in 1997. He also wrote "Let's Kick Racism Out Of Football", a song commissioned for Southampton FC. 3. But it was the moment he met production duo Artful Dodger that his career really took off. "We had this connection," the star recalled in an interview. "I was writing songs but I hadn't got any music; they were writing music but they had no top line melodies. You couldn't have asked for anything better." 5. Craig released his first single, 'Fill Me In', which went straight to number one in the UK. 6. His debut album 'Born To Do It' also soared to UK number one in 2000, eventually going 6x Platinum. The record sold over 1,860,000 in the UK alone, before achieving major success over the pond (it sold over a million copies in the US!) Previous collaborator Mark Hill from Artful Dodger played a huge part in the record's creation. 7. Craig scooped up three MOBO awards in the same year for his work on 'Born To Do It'. Hosting smash singles including '7 Days' and 'Walking Away', the album truly placed Craig at the top of the music game and earned him three Ivor Novello Awards as well as six BRIT Award nominations in 2001. 8. His follow-up album, 'Slicker Than Your Average', peaked at number four and was packed with bangers. Released in 2002, the record went 2x Platinum in the UK and consisted of huge hits like 'What's Your Flava? ', 'Hidden Agenda' and 'Rise & Fall' - the latter being a collaboration with international recording artist Sting. Now signed to Warner, Craig switched up his genre and began leaning towards adult contemporary R&B. 'All The Way' sent him back into the Top 3 and the album achieved success in the UK. 11. The album's fifth track, 'Johnny', is actually about his sad memories of being bullied. David was bullied by other students a when he was a school. In the track, 'Johnny' is portrayed as the bully who targets Craig in the song, which is written in an open letter style aimed at his parents. 12. His fourth album 'Trust Me' was released in 2007. The record featured 'Hot Stuff (Let's Dance) which features a sample from David Bowie's iconic 1983 single 'Let's Dance'. The song peaked at number seven. 14. Many people don't know that Craig has an honorary degree. Craig received an honorary degree of Doctor of Music from Southampton Solent University in 2008 in recognition for his contribution to the music industry. Rita Ora and Tinchy Stryder teamed up with Craig for the single, which served as a reminder of the singer's garage days. The album went silver in the UK. The record features covers of classic tunes from the likes of Stevie Wonder, Otis Redding, Marvin Gaye and Al Green. 17. After his sixth album, Craig sold his Hampstead home and relocated to Miami, Florida. On his break, the singer said "Miami was a beautiful period of time just to enjoy living." His bought a luxurious all-white penthouse in the sunny city, and began taking major interest in body-building and getting into shape. 19. TS5 remains hugely successful to this day, taking Craig everywhere from Ibiza to Glastonbury. Craig continued to hone his craft from 2014, releasing various taster tracks on his Soundcloud and previewing them on his regular TS5 show. 'Cold' and 'Seduction' were two tracks that didn't make it onto his long-awaited sixth album, but did go down well with fans. 21. After countless promotional TV and radio appearances, Craig was ready for the ultimate return. January 2016 brought a new signing with Sony, along with the promise of a new album by the end of the year. His hit single 'When The Bassline Drops' featured Big Narstie and flew straight into the Top 10. 22. 'Following My Intuition' dropped in September 2016 debuted at number one in the UK. His long-awaited comeback album provided David with his first number one album since his debut record 'Born to Do It'. Fans old and new went wild for the singer's new music, with singles like 'Not Giving Up', 'Ain't Giving Up' and 'One More Time' garnering huge success. 23. The 'Following My Intuition' 2017 Tour commences later this year. And with support from the likes of long-time collaborator Big Narstie and newcomer Lauren Faith, it looks set to be an incredible show.